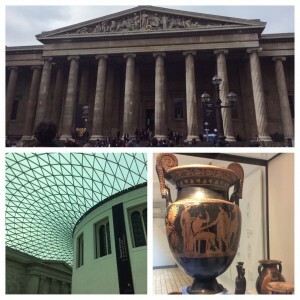 Today we went to the British Museum. I was interested in the juxtaposition of my viewpoint of the artifacts to the viewpoint of others in our group. As architecture majors, you are all trained to look at the design and form and such (I’m getting better at my architecture terms, but I have a long way to go, forgive me). I tend to look at them more in the historical perspective. I think about the classics courses I’ve taken when looking at the Elgin marbles, about the stories of Athens and of the Parthenon. I imagine many others studying the textures and materials and methods, etc. Correct me if I’m wrong, but many of you guys are more drawn to the”interesting” objects than to the historically significant objects (though, in the context of the British Museum, this is all relative as everything is historically significant). It was an amazing trip, but I imagine I got very different things out of it.